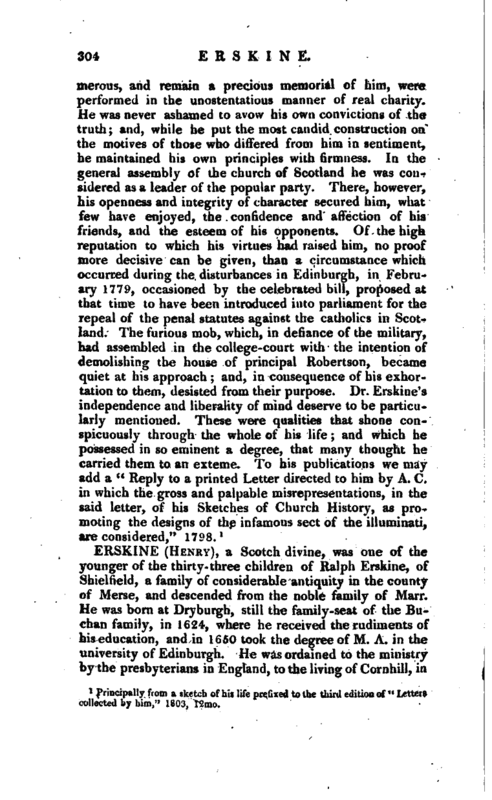 , D. D. an eminent divine of the church of Scotland, was born June 2, 1721. He was the eldest son of John Krskiue, esq. of Carnock, afterwards of Cardross, advocate, and professor of Scotch law in the university of Edinburgh, who is well known by his “Institutes of the Law of Scotland,” a work of the highest authority and reputation. His grandfather, colonel John Erskine, third son of Heury lord Cardross, was a man of eminent piety, and distinguished by his services in support of the revolution in 1688. 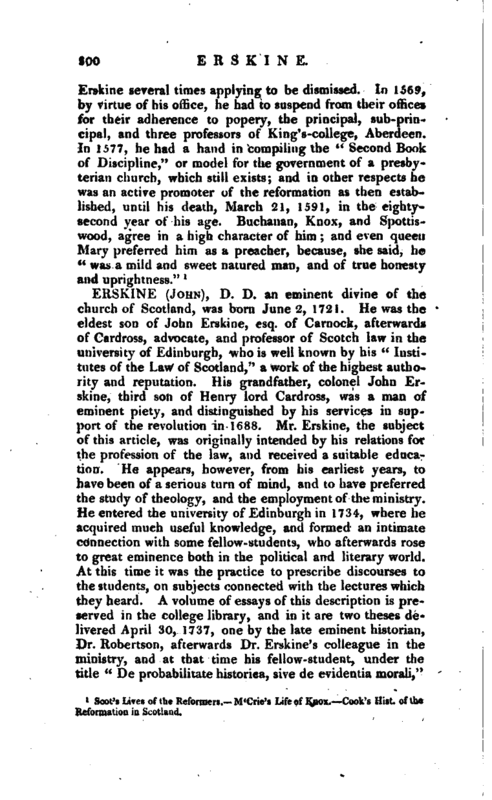 Mr. Erskine, the subject of this article, was originally intended by his relations for the profession of the law, and received a suitable education. He appears, however, from his earliest years, to have been of a serious turn of mind, and to have preferred the study of theology, and the employment of the ministry. He entered the university of Edinburgh in 1734, where he acquired much useful knowledge, and formed an intimate connection with some fellow-students, who afterwards rose to great eminence both in the political and literary world. At this time it was the practice to prescribe discourses to the students, on subjects connected with the lectures which they heard. A volume of essays of this description is preserved in the college library, and in it are two theses delivered April 30, 1737, one by the late eminent historian, Dr. Robertson, afterwards Dr. Erskine’s colleague in the ministry, and at that time his fellow-studeiU, under the title “De probabilitate historiea, sive de evidentia morali,” | the other by Dr. Erskine, entitled “De rectae rationis usu Icgitimo, sive de libertate cogitandi.” They are both written in very pure Latin, and discover a considerable acquaintance with philosophical discussions. Theology, however, was his favourite study; and his predilection for the ministerial function increasing, he persevered, notwithstanding the opposition of his relations, in the necessary preparatory studies; which being completed, he obtained a licence from the presbytery of Dumblane, in 1742. 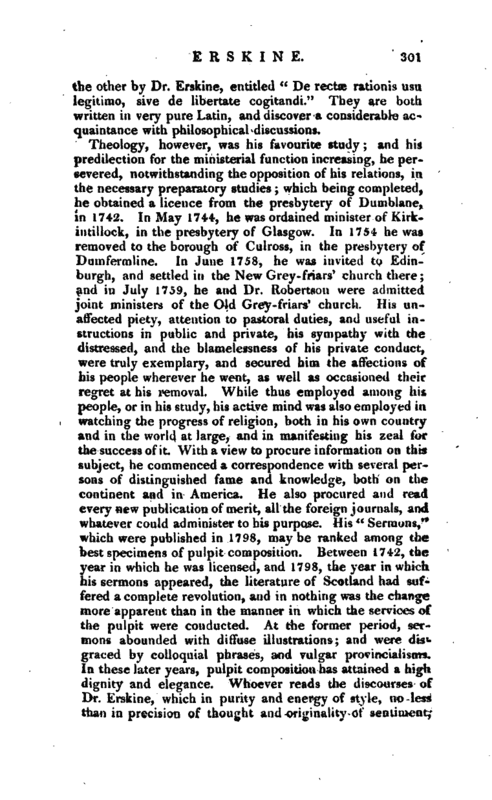 In May 174-4, he was ordained minister of Kirkintillock, in the presbytery of Glasgow. In 1751 he was removed to the borough of Culross, in the presbytery of Dumfermline. In June 1758, he was invited to Edinburgh, and settled in the New Grey-friars’ church there; and in July 1759, he and Dr. Itobertson were admitted joint ministers of the Old Grey-friars’ church. His unaffected piety, attention to pastoral duties, and useful instructions in public and private, his sympathy with the distressed, and the blamelessness of his private conduct, were truly exemplary, and secured him the affections of his people wherever he went, as well as occasioned their regret at his removal. While thus employed among his people, or in his study, his actiye mind was also employed in watching the progress of religion, both in his own country and in the world at large, and in manifesting his zeal for the success of it. With a view to procure information on this subject, he commenced a correspondence with several persons of distinguished fame and knowledge, both on th continent and in America. He also procured and read very new publication of merit, all the foreign journals, and whatever could administer to his purpose. His “Sermons,” which were published in 1798, may be ranked among the best specimens of pulpit composition. Between 1742, the year in which he was licensed, and 1798, the year in which his sermons appeared, the literature of Scotland had suffered a complete revolution, and in nothing was the change more apparent than in the manner in which the services of the pulpit were conducted. At the former period, sermons abounded with diffuse illustrations; and were disgraced by colloquial phrases, and vulgar provincialisms, In these later years, pulpit composition has attained a highdignity and elegance. Whoever reads the discourses of Dr. Erskine, which in purity and energy of style, no less than in precision of thought and originality of sentiment, | may challenge a comparison with any contemporary sef+ inons, must be sensible that their author, whose education bad been completed sixty years before their publication, must have paid no common attention to literary composition, and could watch the variations of taste, keep pace with its improvements, and adapt his productions to the style of the day. Yet he did not servilely imitate the refinements of others, or allow himself to be passively borne along with the stream of fashion. His labours contributed to accomplish that revolution to which we have just now alluded, and to form that standard which we admire; but he had nobler objects in view than the bare information of the literary taste of his countrymen, although he was far from indifferent to this object. In the detached sermons which he printed when a country clergyman, there was a propriety and correctness which had never been exhibited in any religious productions of North Britain, and which was scarcely surpassed in the English language at that time. His “Theological Dissertations,” which appeared so early as 1765, contain several masterly disquisitions on some highly interesting branches of divinity. The subjects, indeed, did not admit a display of eloquence; but throughout the whole, he has shewn great soundness of judgment, as well as an intimate acquaintance with the doctrines of the Gospel, and history of the Christian church. His eagerness to obtain information of the state of religion abroad, and his facility in the acquisition of languages, induced him, at an advanced period of life, to learn the German and Dutch languages, which he did with amazing rapidity, by mere dint of private application. 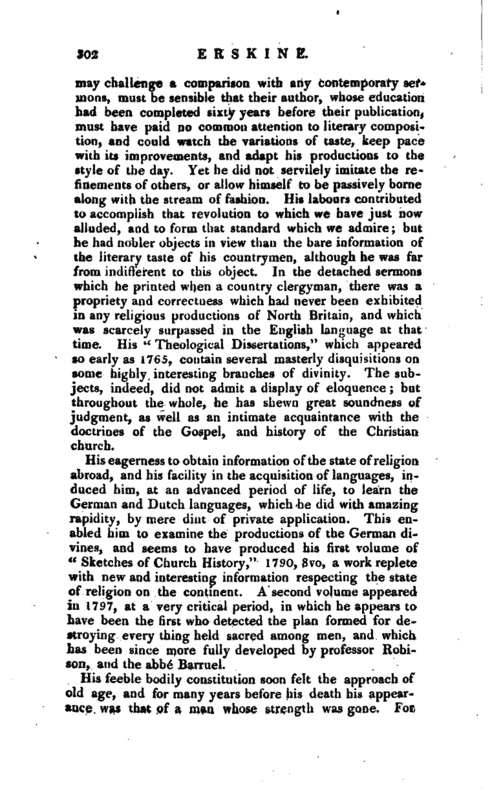 This enabled him to examine the productions of the German divines, and seems to have produced his first volume of “Sketches of Church History,” 1790, 8vo, a work replete with new and interesting information respecting the state of religion on the continent. A second volume appeared in 1797, at a very critical period, in which he appears to have been the first who detected the plan formed for destroying every thing held sacred among men, and which has been since more fully developed by professor Robison, and the abbé Barruel. Hi feeble bodily constitution soon felt the approach of old age, and for many years before his death his appearance was that of a man whose strength was gone. For | several winters he was unable to preach regularly; and during the last thirteen months of his life he did not preach at all, his voice having become too weak to he distinctly heard by his congregation. Still, however, the vivacity of his look, and the energy of his manner, bespoke the warmth of his heart, and the vigour of his mind; and his mentalfaculties remained unaffected by his bodily decay. His memory was as ready, his judgment as acute, his imagination as lively, and his inclination for study as strong as in his youthful years. To the last hours of his being he was eagerly employed in those pursuits which were the business and pleasure of his life. After 1801, he published five numbers of a kir^d of periodical pamphlet, entitled “Religious Intelligence from abroad;” and on the week before his death he sent his bookseller notice, that he had collected materials for another number. His great modesty and diffidence in his own talents, rendered him averse to publishing much of his own, while he was ever ready to bring forward the works of others. The public regretted that he spent his thne in labours of this kind; and his friends remonstrated against the impropriety of his depriving the world of the benefit of his own productions. 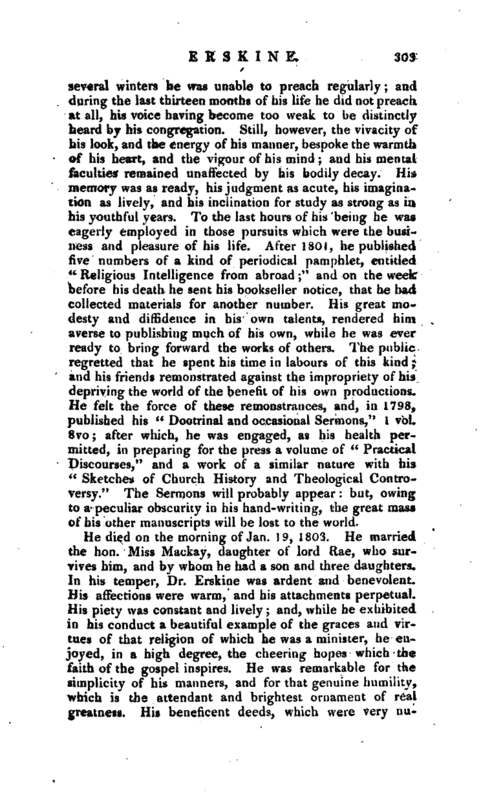 He felt the force of these remonstrances, and, in 1793, published his “Doctrinal and occasional Sermons,” 1 voL 8vo; after which, he was engaged, as his health permitted, in preparing for the press a volume of “Practical Discourses,” and a work of a similar nature with his “Sketches of Church History and TheologicalControversy.” The Sermons will probably appear but, owing to a peculiar obscurity in his hand-writing, the great mass of his other manuscripts will be lost to the world. Principally from a sketch of his life prefixed to the tbird edition of " Letters collected by him.